Providers interested in securing incentive reimbursement from the CMS EHR Incentive Program need to be using a certified EMR in order to achieve meaningful use requirements. But, selecting an EMR shouldn’t just be about whether an EMR is certified. 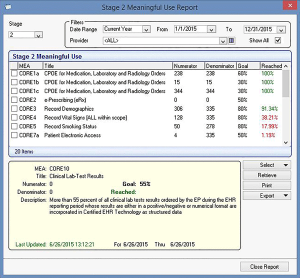 The key is to select a meaningful use EMR that is easy to use, contains at-a-glance features to track success in achieving meaningful use and is customizable for your specialty and practice. Adhering to the requirements of any new government program can be daunting. Which is why we designed MicroMD EMR with eligible professionals (EPs) in mind. MicroMD EMR helps providers navigate the new workflows and requirements providers will need to implement and meet in order to secure financial EHR incentives. 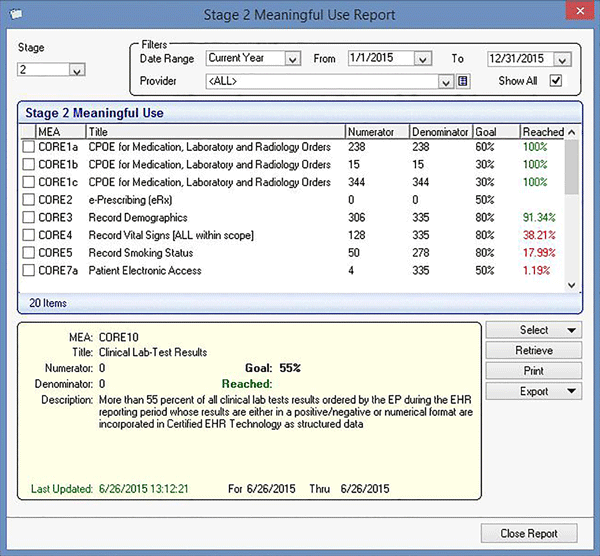 In addition to the already simple yet powerful MicroMD EMR functionality, such as flexible charting options, specialty specific content, e-Prescribing and alerts, MicroMD EMR, meaningful use EMR, incorporates meaningful use functionality that allows providers and staff tools to achieve, monitor and attest to meaningful use. MicroMD training and implementation staff are well-versed in practice-specific EMR set up and ways to help staff and providers ensure a successful go-live and adoption of the new meaningful use functionality and features. Onsite training and tools, including Quick Reference Guides and online video tutorials. One-on-one training is also available to help the providers and staff understand the meaningful use functionality in-depth, as well as how the organization can achieve meaningful use as quickly, efficiently and effectively as possible. Consider enlisting the help of experts who understand every nuance of MicroMD EMR and the meaningful use requirements register for our EMR Incentive Monitoring Service. Offered exclusively to MicroMD EMR clients, the consultative service is designed to guide providers through successful adoption and consistent use of MicroMD EMR functionality. The service includes periodic monitoring, usage analysis and one-on-one coaching to help providers achieve meaningful use quickly and efficiently. Our commitment does not stop at Stage 2. With three stages of meaningful use for providers to achieve through the duration of the incentive program, providers need to rely on a meaningful use EMR that will help them secure reimbursements from Day 1 to the last. We will continue to enhance future versions of MicroMD EMR to meet the evolving meaningful use requirements.